BRING FOOD with you when you travel that make you feel good… just in case avail food is not good. Salads, fruit, protein snacks, etc. BRING EXTRA WATER of course, and possibly get some H2O Overdrive for when you need instant help for mucous membranes. Sometimes too much water can thin out your mucous membranes too much, leaving you feeling dehydrated! If so, go for diluted pineapple juice or that H2O Overdrive drink to soothe those membranes. Some people benefit from products like Throat Saver. Steer clear of black tea. STEAM YOUR THROAT with showers, hot baths as you get ready for your gigs, and also when you get into your hotel room from the dry-air vehicle or drive or flight. GET SLEEP! Even if you have to take a sleep aid like melatonin, Sleepytime Tea or whatever healthy thing works for you. Sleep is as important as food and hydration for the voice. When singing on the road, sometimes it's difficult to get the zzz's in, you sleep on the bus, arrive at the hotel in the middle of the night, have to get to soundcheck... but talk this out with your road manager before you leave and plan the time to get quality sleep. DO PHYSICAL WORKOUTS: 15 – 30 min short workout on gig days to warm and limber you up for performance and keep your core toned for singing. Consider bringing workout DVDs and any physical workout bands, ropes, etc you could use in your hotel room or on a bus. DO NOT NEGLECT TO WARM UP! Also, after your longer gigs especially, take 10 min to warm down after your gig so you don't sabotage your voice for the next day! LIMIT TALKING, and when you DO talk, pull your words. Try to schedule interviews for after your shows instead of before, if at all possible. CENTER YOURSELF: 10 minutes before your gig, try to find a quiet corner and don’t interact with anyone. Just center yourself, mentally send your presence out to occupy the venue. Prepare yourself by imagining the first verse you’re about to sing on your first song. Ignore distractions like an Olympic athlete preparing to ‘do it’. GET MONITORS RIGHT: Make sure you have enough vocal level so you don't have to push those strong notes during performance. AFTER THE SHOW: As you warm down, take a quick inventory... how does your voice feel? It should feel better than when you began the show. If not, try to figure out why. You know you can always reach me by phone or Skype. Have a BLAST! 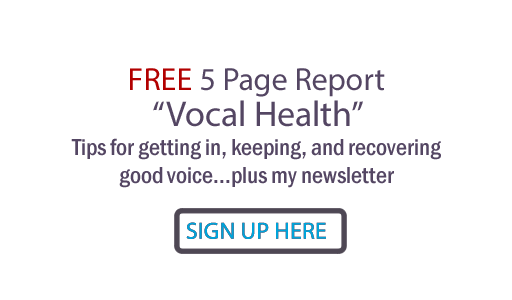 You're taking care of your voice so you can ditch the worry! And do check out Lyndsey Highlander. She is beautiful inside and out, dedicated to the constant improvement, a dynamo in performance and has one of the best voices I've ever worked with (which is saying a lot). These are all excellent points. Singing is an athletic activity, as it is simultaneously using many muscles, so your overall health affects your singing health greatly. Thank you Gary; great to hear from a fellow vocal coach! Would love to keep in touch.